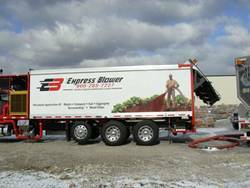 Rod Locks for Blower Trucks | Advanced Machine & Engineering Co.
On the interior of these trucks, turf maintenance media such as aggregate, seed, soil, and mulch are channeled by motorized augers and a conveyor to the pneumatic applicator. Advanced Machine & Engineering (AME) of Rockford, Illinois, and Hydrotech, the AMLOK® distributor in the Cincinnati area, worked with Finn Corporation of Fairfield, Ohio, to implement the use of AME's AMLOK® rod locks onto the interior side of the lift gate of Finn's pneumatic blower trucks. As a result of the distinct operational advantages, this technology is now a widely applied feature on these vehicles. Finn Corporation is a leading supplier of hydro seeding and blower trucks for the pneumatic application of seed, straw, mulch, pea gravel, and other turf maintenance media. Typically, the media are dispersed through a pneumatic applicator, fed by powered augers and conveyors in the truck bed. Accessing the truck interior occurs via a rear hydraulic lift gate. Until recently, this gate was operated by two persons, one operating the hydraulic power unit and another climbing under the open gate to set a steel prop rod into place. The door would then be lowered into contact with a mechanical stop to hold the door open at various heights for troubleshooting, routine maintenance and media inspection. 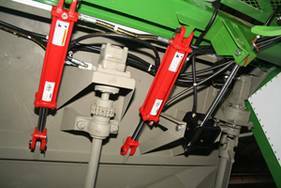 Close-up shows the AMLOK® rod lock (on far right in photo), provided by Advanced Machine & Engineering, that mechanically locks the massive lift gate into position, in the event of a hydraulic pressure loss. The rod lock mechanically disengages on re-energizing of the system. The lift gate is powered by dual-acting hydraulic cylinders, swinging the gate up and down in a 65º arc. The motors, augers, beater bars, and the transfer conveyor for the media in use are all enclosed in the truck bed, so this gate operates with considerable frequency in the field. Marketed under the Express BlowerTM name, these trucks generate substantial blow-thru force to channel the media up to the applicator station, usually hand-held by an operator on the ground. The master control, program screen, and operational indicators are mounted on the truck body for easy ground access. Illustration shows the locked and unlocked functionality of the AMLOK® rod lock. Left: Hydraulic pressure loss with zero back pressure. Right: Hydraulic pressure at minimum release pressure not to exceed 3000psi. 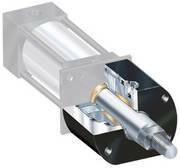 AME engineers all RCH hydraulic rod locks to exceed the application's maximum values. At the request of Finn, Hydrotech engineers began to explore the possibilities available for mechanically locking the cylinder rods in place automatically without using the prop rod as well as a loss of hydraulic pressure and contacted AME for assistance. Advanced Machine & Engineering pioneered the development of mechanical rod locks, and their AMLOK® brand is in use worldwide in myriad industrial and commercial applications. AME Business Development Manager for AMLOK®, Ken Davis, explains, "We had previously encountered many similar applications, though none in this exact area. By combining our AMLOK® rod lock, rod, and rod eye, plus cartridge valves and bodies supplied by the Hydrotech engineering staff, we worked with Finn to devise a system to mechanically hold the lift gate securely at any angle, with rod release occurring on operator command. Simple enough, really, once we put our engineering heads together with the customers, both Hydrotech and Finn, in this case." The AMLOK® rod lock is a "power off" mechanical rod lock. If the directional valve is de-energized, the hydraulic hose breaks, or other loss of hydraulic pressure occurs, the rod lock mechanically holds the rod in place securing the lift gate position. A shuttle valve is used, since the cylinders are double-acting, to feed the pressure side to the directional valve. In normal operation, when the valve is energized, the rod lock releases. Since only one operator is now required to raise and lower the lift gate, greater efficiencies are being realized in the operation of these Finn pneumatic blower trucks and the company's other vehicles. "At our annual summit meeting of Express Blower customers, they emphasized the need for an automatic door prop system. Hydrotech introduced us to AMLOK® from AME and we quickly had a system installed on our prototype truck and an answer to our customers needs. In my estimation, this is a prime example of how a corporate partnership works to solve the needs of the end-user," commented Doug Wysong, chief engineer, Finn Corporation.